Fellow Microsoft Access MVP Karl Donaubauer will host the Access DevCon in Vienna, Austria in 2019. Registration information is available at the Access DevCon web site. The Portland Access User Group will hold their annual event at the conference center in the beautiful Silver Falls State Park a few hours south of Portland, Oregon. Registration information is available at the PAUG conference web site. 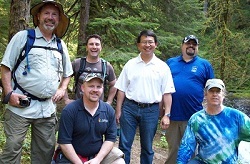 FMS President, Luke Chung, is a Microsoft MVP and participates at a variety of Microsoft related events. He attends the annual MVP Summit in Redmond. The next one is the week of March 18, 2019. He also attends regional MVP Events at Microsoft offices including recent meet-ups in Malvern, PA; New York City; Reston, VA and Washington DC. 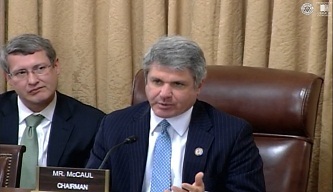 FMS also participates in the political process on behalf of small, technology businesses. 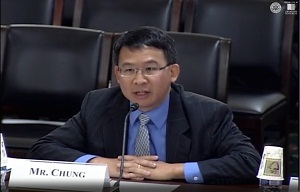 FMS President, Luke Chung, has actively worked with the Association for Competitive Technology and Microsoft's Voices for Innovation's annual lobbying events on Capitol Hill. The Washington DC Access User's Group Quarterly Meeting was held at the Microsoft Store in Tysons Corner Center. The DC Access members shared their experiences with Microsoft Access and the solutions to different Microsoft Access questions. For more information on the next meeting, visit Washington, DC Microsoft Access Meetup. In conjunction with the Microsoft MVP conference, FMS President Luke Chung attended the Microsoft Access Day in Redmond, Washington! FMS President Luke Chung attended the Washington, DC Access User's Group Quarterly Meeting at the Microsoft Store in Tysons Corner Center. Tammy Lawson gave a presentation on Integrating Microsoft Access with PowerBI to create visualizations. FMS President Luke Chung attended the Washington, DC Access User's Group Meeting at the Microsoft Store in Tysons Corner Center. The DC Access members shared their experiences with Microsoft Access and the solutions to different Microsoft Access questions. FMS was a sponsor for the second Microsoft Access Developer Conference in Vienna, Austria (DevCon web site). Fellow Microsoft Access MVP Karl Donaubauer hosted a sold-out event with 60 attendees from 13 countries. FMS President Luke Chung was a featured speaker for the 2018 conference and gave a new presentation on Differences between Microsoft Access Versions and supporting deployments to them. Photos from the 2018 event are available in our Facebook Album. FMS President Luke Chung was a featured speaker among the invited MVPs. He helped the college students learn more about careers and opportunities in the technology field, what employers are seeking, job hunting tips, and a variety of other topics the young adults raised. FMS President Luke Chung was a featured presenter. He presented Microsoft Access Form Tips and Techniques. FMS President Luke Chung provided an introductory overview of Microsoft's Power BI tool to create dynamic dashboards with to visualize data. Some of the examples come from Fairfax County government's Infographics gallery. FMS President Luke Chung was the featured presenter at the Microsoft Access User Group meeting in New York City. He shared his experiences and demonstrated FMS products for Microsoft Access, SQL Server, Azure cloud computing, and techniques to improve your productivity. The Portland Access User Group held their annual event at conference center of the beautiful Silver Falls State Park a few hours south of Portland, Oregon. The extended weekend event brought together some of the top Microsoft Access developers, enthusiasts, and Access development team members. FMS President Luke Chung was invited to speak for the 7th year in a row. He gave a presentation on 32 vs. 64-bit Access development including the differences in VBA programming. FMS friend and Microsoft Access MVP Karl Donaubauer organized a Microsoft Access conference in his hometown of Vienna, Austria the weekend of April 1-2, 2017. He has organized many Access conferences in Germany and Italy. This was his first conference in English. FMS President Luke Chung was a featured speaker and discussed Microsoft Access Strategies and Products. Many of the world's leading Microsoft Access developers spoke with Luke. Visit the agenda to learn more. Karl gave a personal walking tour for those who arrived a day early of his beautiful and historic city of Vienna, a UNESCO World Heritage site. FMS President Luke Chung was invited to speak for the 6th year in a row. He gave a new talk on the data analytics features added to Excel 2016 and how it could work with Access. He also participated on several panels discussing Microsoft Access and the software business. FMS President Luke Chung was invited by the Portland Access User Group for the 5th time to speak at their annual event. 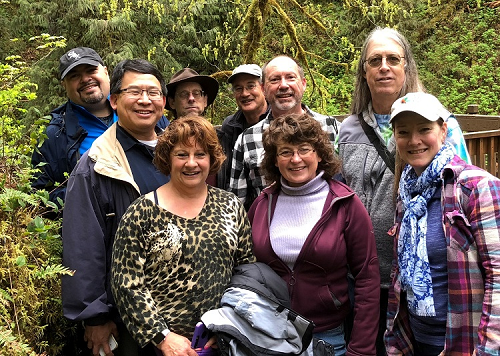 Held at the conference center of Silver Falls State Park south of Portland, Oregon, the weekend event included some of the top Microsoft Access developers, enthusiasts, and Access development team members. Luke presented on Microsoft Access automation of Office programs such as Excel, PowerPoint and Word. He also participated on multiple panels discussing Microsoft Access, consulting services, and running a business. FMS President Luke Chung and several other Microsoft Access MVP speakers presented at this one day event for Microsoft Access developers. Organized by J Street Technology, this was a lively and educational event with other Microsoft MVP and Access Development team speakers. FMS President Luke Chung was a featured guest speaker for the Microsoft Access User Group meeting in New York City. Luke discussed and demonstrated FMS products for Microsoft Access, and answered questions about his experiences with technology, media, and business. FMS President Luke Chung was a speaker for the 4th year in a row at this annual Microsoft Access conference hosted by the Portland Access User Group. Speakers included several Microsoft Access MVPs and members of the actual Microsoft Access development team. FMS President Luke Chung joined several other Microsoft Access MVP speakers at the one day event for Microsoft Access developers. In addition to Luke, speakers included the organizer Armen Stein of J Street Technology, George Hepworth, Tom van Stiphout, Andrew Couch from the UK, and Kevin Bell from Microsoft. FMS President Luke Chung was one of the featured speakers at this annual Microsoft Access conference hosted by the Portland Access User Group. This was his third year speaking at this wonderful event. Luke participated in various talks on Microsoft Access development, running a business, and creating solutions using Visual Studio LightSwitch for Microsoft Access developers. FMS President Luke Chung attended the 2013 MVP Global Summit in Bellevue, WA with 1,400 MVPs from around the world. Luke Chung was a participant and speaker at the MoDevEast conference held at the headquarters of Gannett. Luke participated on a panel hosted the Association for Competitive Technology. Discussions included FMS' experience with data based mobility/smartphone solutions and helping the many mobility startup firms grow their businesses, approach government opportunities, and strategies for success in a rapidly changing technology and regulatory environment. Luke discussed and demonstrated FMS products for Microsoft Access, Azure cloud computing, and answered a variety of questions about his experiences. FMS President Luke Chung attended and spoke at the three day Microsoft Access conference sponsored by the Portland Oregon Access User Group. He was joined by Microsoft speakers Ryan McMinn, Microsoft Access Senior Program Manager Lead, and Kevin Bell test engineer on the Access team. Other speakers included industry authors and notables F. Scott Barker, Alison Balter, Juan Soto, and Armen Stein. Click here for Luke's presentation on: Tips and Techniques for Taking Over and Existing Microsoft Access Application. The picture on the right came from a hike through the forest and waterfalls after the conference. 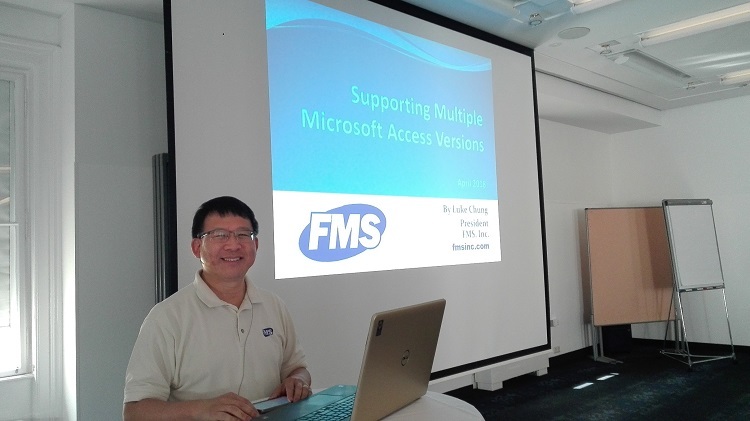 FMS President Luke Chung gave six presentations at the three day Microsoft Access conference sponsored by the Portland Oregon Access User Group. See pictures from the conference on our Facebook Page. FMS President Luke Chung was the guest presenter at the April 5th meeting of the Denver Access User Group. He discussed Microsoft Access 2010, FMS products for Microsoft Access, and Access with cloud computing. FMS President Luke Chung participated on a panel discussion about Accounting and Technology for ecommerce companies. Here's a summary of Financial Reporting for Startup and Ecommerce Organizations. FMS President Luke Chung gave several presentations on Microsoft Access application development and FMS products at the University of Queensland, St. Lucia campus. FMS was an official conference sponsor. Luke Chung, President of FMS, was a guest speaker at the Seattle Access User Group monthly meeting. For more information, visit the Seattle Access User Group website. Microsoft invited FMS President Luke Chung to participate on three panel discussions at their annual conference. Are you a software consultant, or part of a consulting company? Or are you thinking of going independent? This panel will discuss topics like getting started, advertising and marketing, client communication, estimating, managing employees and subcontractors, getting paid, etc. Typically migrating or loading data from one platform to the next is the easy part. This interactive session explores the pros and cons of the tools to help you get there: the SSMA Migration Assistant, the Access Upsizing Wizard, SSIS and BulkCopy. More importantly we'll discuss techniques for dealing with common problems, such as data type incompatibilities and application architecture. We will also explore moving data from Excel, Oracle, and Access to SQL Server. This session will feature open Q&A from the audience to a panel of experts. During tough economic times, development teams tend to get smaller while business requirements get larger in an effort to do more with less. The panelists will share their insights and experiences glean from years of surviving economic ups and downs. There is no one right or wrong way to do development. The cumulative experience of the panelists encompasses the full range of consulting and vendor experiences spanning the last 20 years. Luke Chung was the featured speaker at the March 19th Denver Access User Group meeting held at the Microsoft Office. He covered Microsoft Access 2007, the FMS products for Access, the Access market, how to deal with these challenging times, and entertained questions that arose. Visit http://www.daaug.org for more details! Special Guest: Luke Chung, President of FMS presented an overview of FMS products for Microsoft Access and how they can help developers create better solutions. Products included Total Access Analyzer, Total Visual CodeTools, and Total Access Emailer. He discussed how to create great Microsoft Access solutions, take over existing databases, apply Best Practices, where Access fits, different Access versions, and general Q&A. Visit http://www.SeattleAccess.org for more details! Co-sponsored by the Microsoft Mid-Atlantic Office, FMS provided a half day seminar on Microsoft Access to SQL Server Upsizing. He also spent time at the Microsoft SQL Server booth answering questions. More information on the topic available here: Microsoft Access to SQL Server Upsizing. Visit http://www.ukaug.co.uk for more details! Special Guest: Luke Chung, President of FMS.